Applications in the chassis and underbody systems that call for rubber products includes; shock absorber seals, CV boots and liners, vibration mounts and air springs, all of which contribute to the smooth ride all drivers want. Hoses, cups and boots provide the performance necessary for critical braking and steering systems. Brakes are one of the most critical parts on an automobile and rubber parts used in such applications need to be able to withstand the extreme environmental hot’s and colds, as well as the frictional heat produce from everyday braking. 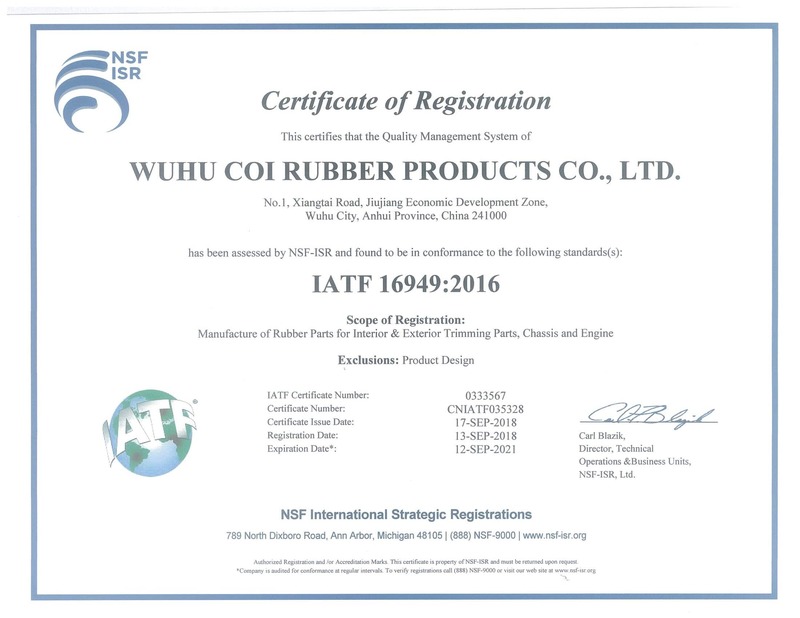 Some of the applications Coi Rubber is currently manufacturing are listed below. Coi Rubber offers varying types of automotive products with rubber to metal vibration isolators which are designed and manufactured specifically for your application. These isolators are used to diminish vibration, impact or shock as well as to reduce noise level during application use. Examples of vibration control devices currently being manufactured are listed below. Engine gaskets and seals used in engine applications require an elastomer that demonstrates great fuel and high temperature stability and Viton® fluoroelastomer is typical the compound of choice for such applications. Products that Coi Rubber produces that use Viton® include: fuel injection seals, fuel pump seals, manifold gaskets, diaphragms and other applications that require custom molded rubber products. With the trend of engine and powertrain systems pushing sealing materials to their limits, Coi Rubber has responded by developing new materials that are able to meet these strenuous demands and still be cost efficient, allowing us to offer very competitive pricing. Many of the power steering applications of today use high-pressure hydraulic systems. Seals for these applications include an input shaft seal and inner and outer rack seals. The input shaft seal also called a pinion seal are for shafts with slow oscillating rotation, and they have operating pressures that are 10 to 20 psi. The outer rack seal and inner rack seal are reciprocating applications and can see pressures up to 1500 psi. Typical rack seals will have plastic PTFE back-up rings to prevent seal lip blowout. The cylinder head gasket is commonly considered to be the most important seal in the automotive engine. The Multi-Layer Steel (MLS) gasket is know the automotive industries preferred method of sealing between the cylinder head and engine block. In this system, multiple layers of cold-rolled spring grade stainless steel are coated with a thin layer of elastromeric material. This thin layer of elastomer is essential to the structure by providing a sealing action to the metal surface imperfections, while resisting aggressive gases, oils and coolants.Nitrile (NBR) is an elastomer that is commonly used, however, Fluoroelastomers , more specifically Viton®, is quickly getting attention for its high temperature resistance and its aggressive resistance to fluids such as, fuels, fuel mixtures, coolants, oils and combustion gases. The Automatic Transmission is a complex system combining several different applications, posing a challenge for seal designers. Typically their are two main types of transmission designs: rear wheel drive and front wheel drive, both requiring seals to prevent any leakage. Rear drive designs, for example, typically employ an input seal to prevent leakage of transmission fluid at the interface between the torque converter and the transmission case. Front drive designs also use an output seal to prevent leakage past the output shaft. Engine mounts are rubber to metal bonded components used to isolate vibration, absorb shock and support load. Coi Rubber’s engine mounts are highly durable and heat resistance.